John Weller introduces yet another yacht to the Fraser Yachts fleet as he signs the 40.5m motor yacht Serque for sale. Serque was custom-rebuilt by her owner and launched on October 15, 2009 after three years of work. 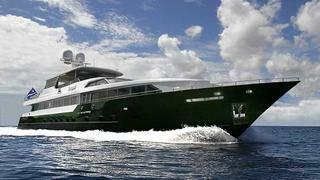 This superyacht's grand exterior was designed by Donald L. Blount and Associates of Chesapeake, Virginia. Luxurious interiors by Pavlik Yacht Design of Fort Lauderdale are complemented by wood work handcrafted in Viareggio, Italy by Genesis Yachtline. Serque accommodates 12 guests in six staterooms, has a cruising range of 2,000 nautical miles and is asking $9.95 million.